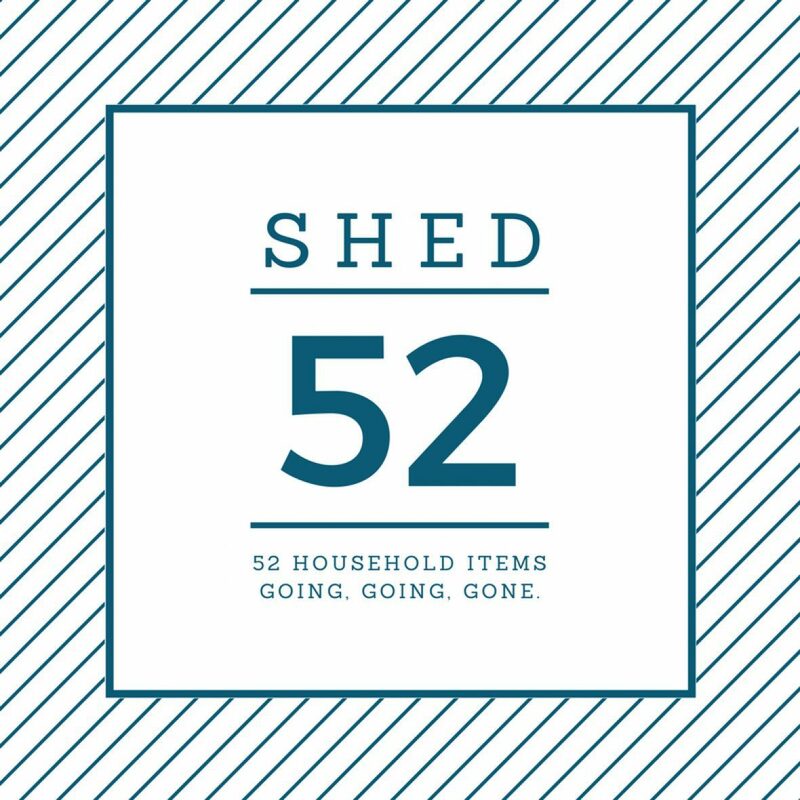 As we mentioned on our Instagram account this morning, we’ve been struggling to sell the item we posted on Shed52 this week. It seems folks in our area aren’t interested in a vintage Stakmore table and chair set, even though we’ve set it at the all-too-fair price of $399. These pieces usually hold resale values of around $450 and apparently the more seasoned Bridge players among us have been known to lay down up to $500 for a set in mint condition. Unfortunately, it also appears that seasoned Bridge players have no idea what Facebook Marketplace is, and probably aren’t following our Instagram for the latest and greatest on what’s happening at Shed52. Seasoned Bridge players are the worst. I kid! No matter the reason why buyers in our area aren’t biting this week, the home organization gods (all named after modular Scandinavian sofas) presented an opportunity that we just couldn’t turn down. It’s a de-cluttering dilemma with a happy ending, so gather round on the Norsborg on this chilly Boston evening and get ready for some Hygge-style story time. you and me, dear reader. cuddle up. Yesterday, while discussing our recent exploits in blogging and inspiration for Shed52, my boss and I turned to the subject of her house. She lives in a beautiful cape just outside of Boston that’s recently undergone lots of updating and upgrading, including expanding their family to include three adorable kids. This has also meant lots of change and transition in terms of furniture, storage and home organization needs as the kids get older, bigger, and more outspoken about their indisputable interior decorating needs. This isn’t her kids’ bedroom, but I found it on the internet and wondered if this was a surprise for some kid, and how that worked out for everyone. With new stuff going in to her house and old stuff coming out- including cribs and baby clothes that she has generously donated to coworkers and friends- my boss mentioned casually that she’d like to sell an item or two like we have been. She doesn’t have Facebook and jokingly (I think) said that I should post her Ikea MALM Dresser on Shed52. I jokingly (I think) replied that I’d totally do it if she’d donate some of the proceeds to charity*, and she seriously (I hope) agreed. So last night, she sent me a quick pic of the item, which I then posted to the Marketplace for $80. It was actually like a regular MALM. Within roughly 30 seconds, a totally trustworthy 20-something named Gabe offered full price, and I mistakenly told him we’d be donating 100% of the proceeds to charity. ** I also then explained that it wasn’t my stuff. And that it wasn’t located at my house. And that the person he’d meet when he picked it up would actually be the nanny. But not my nanny. It would be my boss’s nanny. And also there would be a sleepy baby. Needless to say, I was equal parts surprised and impressed when Gabe actually showed up today. The Jimmy Fund, an amazing charity for pediatric cancer patients and their families. The best part about this unexpected detour in our de-cluttering efforts on Shed52 is that 50%*** of the proceeds of this sale will go directly to the Jimmy Fund, a charity that my boss supports regularly in honor of her dad. It’s inspiring to think about how the “stuff” of our every day lives can go from supporting the wellbeing of the littlest and newest people in our families to honoring elders or loved ones whom we’ve lost. It might seem trite to aggrandize the function of a piece of bedroom furniture, but these humbling encounters over the past few weeks have me rethinking the value of clutter. So there you have it. 24 hours, 80 bucks, and one truck later, and we’ve at least helped one home scale down on their stuff. We still have 4 days to try and meet our goal of getting rid of the Stakmore set, but if we don’t meet our deadline, can we get a free pass this time around? I think Gabe and his 80 dollars worth of assembly-free storage would vote yes. If this gets $399, we’ll be donating $200 to survivors of Hurricane Harvey in Houston, Texas. Spread the word. What suggestions do you have for getting this table/chair set out the door at our place? Can we pull it off in time? Tell us how, and check back later this week to see if we’re in for another win, or what happens if we’re not! **100% = like, all of the proceeds. oops. ***sorry, boss! you’re super great and generous. please don’t fire me. You are freaking awesome! Poor Texas, God. I live in Austin half the year, but I won’t be there till December. I imagine their population is about to grow. That Dino bed! Haha! I COULD NEVER GET TO SLEEP! No no no.